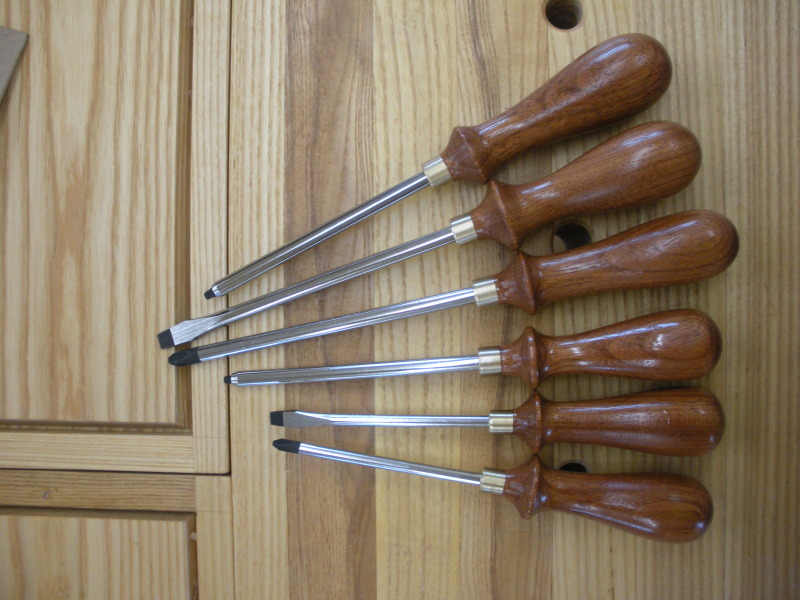 I’ve been wanting to make my own set of wooden handled screwdrivers for several years but I was never able to find a source for screwdriver shafts. In 2008 while attending the Woodworking In America conference in Berea, KY I had an opportunity to chat with Rob Lee, the owner of Lee Valley, a supplier of premier quality woodworking tools. 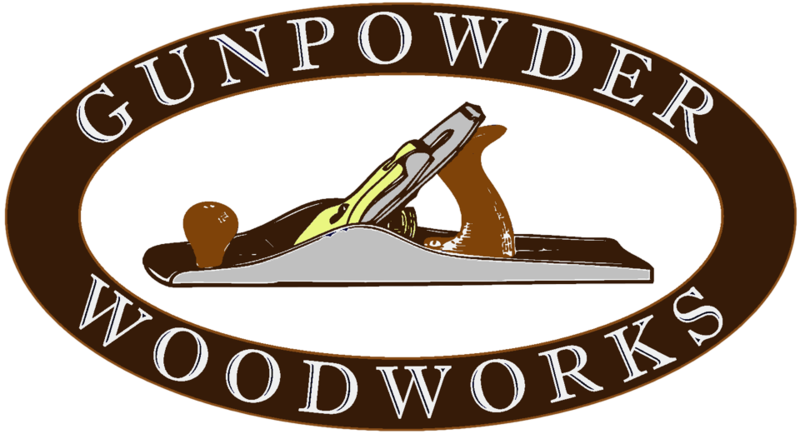 I told him that I though they should make a turning kit for screwdrivers and that I was sure many more woodworkers would be interested in creating their own screwdrivers. He wrote the idea down in a little notebook and said that he’d pass it by his product guys when he got back. I didn’t think too much more about it. Then, this summer a Lee Valley catalog arrived in my mailbox and inside the front cover was a Screwdriver Turning Kit, exactly as I had requested with three each for phillips, blade and square drive. I immediately went to my computer and ordered all nine shafts. After the shafts arrived, my next stop was the hardware store to find some brass compression fitting nuts to use as ferrules. The shafts are sized metrically, but they work out to even 1/64th” measurements. The compression fittings however do not come in that large of a range so the middle sized shafts have a slight gap around the shaft, but the large and small shafts are dead-on. Let me preface this post by saying that I am a complete newbie at turning. In fact, this whole process was kind of a trial by fire. I am not trying to say that that this is “the” way to build these screwdrivers, it’s just the way I chose to do it. I decided to document the process to make it easier for those who may decide to undertake this endeavor themselves. Here’s what I started with. I had a chunk of 8/4 Jatoba that I had been saving to make some turning tool handles. I ripped in into 1 1/2″ wide pieces to maximize the yield. Then I turned all the pieces round on the lathe.I recommend against doing this. As it turns out a 1 1/2″ cylinder in about the hardest thing to hold on a lathe – at least with my equipment. None of my chuck pieces would close down to 1 1/2″. I recommend leaving your stock square and securing it in the chuck and then turning the portion you need. One other learning point was that I really cut my stock too short which lead to problems trying round over the top end of the handle. As you can see, the shafts have two “wings” that have been stamped out from the shaft to keep in from rotating in the handle. For most of the shafts you can just slip the ferrule on over the end of the shaft, but for the two largest blade shafts the blade is too large so I had the cut two small slots to clear the “wings” so that I could slide the ferrule on from that end of the shaft before installing it in the handle. 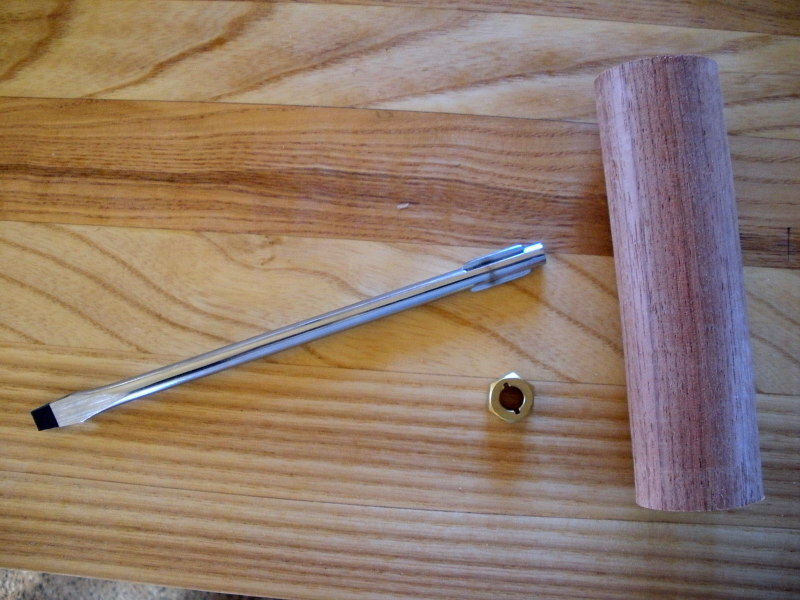 Step 1: Round the stock and then turn a tenon on the end that just allows the compression nut to thread onto the tenon. Step 2: Drill the hole for to match the diameter of the shaft. Measure the distance from the bottom of the wings to the top of the shaft and add in the length of the tenon. Drill the hole that deep so so that the wings will be fully enclosed in the handle. Step 3: Thread the compression fitting back onto the tenon. This is your last chance to adjust the fit. You should be able to thread it on by hand, but not too easily. It’s really important to get this fit perfect. After you have it on, slide your live center up into the ferrule. 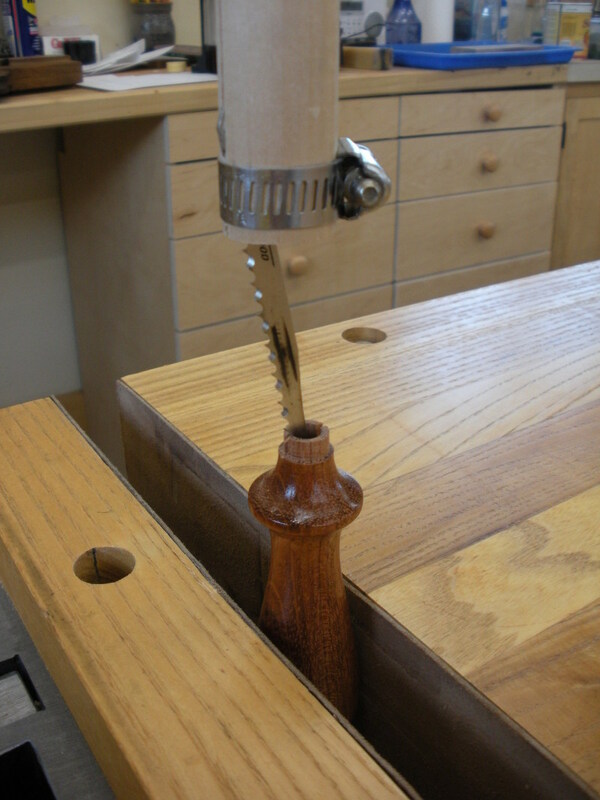 Step 4: Use a parting tool to set the diameters that you want key parts of the handle to meet. I set the widest part of the handle, the narrowest, and the widest part of the thumb flare. Step 5: Turn the handle shape you desire. 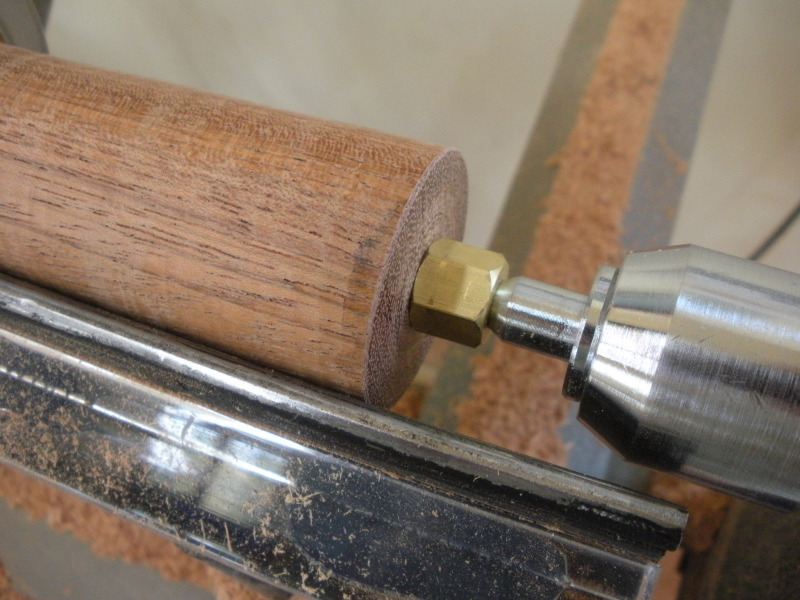 The brass can be turned using normal turning tools. I found the the smaller the tip of the tool, the easier it was with the brass. I used a small spindle gouge. Step 6: Sand and finish your handle. I chose to finish my handle off of the lathe. I used four coats of Deft spray lacquer. It dries quickly and retains a nice shine. In addition, the laquer works well on the brass and will keep it from tarnishing. Step 7: Unscrew the ferrule by hand and set it aside. Insert the shaft into the hole until the wings just come into contact with the wood. Orient the wings so that they are running perpendicular to the grain. Mark the location of the wings on the wood. The wings on my shafts were not quite centered which is why I marked them. 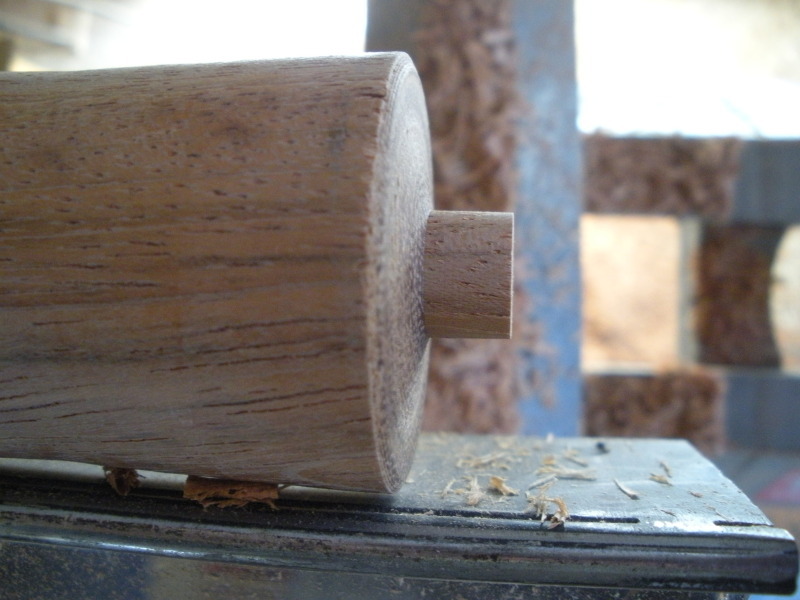 Step 8: Cut a kerf thru the remaining part of the tenon. Be sure not to go into the finished wood. Step 9: Make a kerf inside the hole to allow the wings to seat. I tried my first handle without doing this and it split badly. To make this kerf I ended up using a jigsaw blade. You can see my makeshift tool in the next photo. I just fashioned a quick dowel and then cut a kerf down the middle to hold the jigsaw blade. It’s not pretty, but it worked. I had to grind the back side of the jigsaw blade down to fit in the hole for the small and medium shafts. Step 10: Insert the shaft into the hole. It should required a decent amount of pressure and maybe even a few mallet blows. For this reason I did not use any glue. The shafts are plenty secure without it and now I have the option of cutting the handle off at a later date to re-handle them. If you are installing a blade shaft make sure you have the ferrule on the shaft before installing it. Step 11: Re-install the ferrule. Congratulations! You just made your first screwdriver!